Newly released by the BFI this week ahead of its upcoming sci-fi season, the collection Outer Space – encompassing three classics from the Children’s Film Foundation, directed by Harley Cokeliss, Guy Fergusson and Ian Shand – proves why works from this British studio were so popular amongst children and remain nostalgic for today’s adults. Whether you watched them in the cinema during the 1950s or later on television in the 1970s and 80s, CFF films were an intrinsic part of growing up for many British kids. Always quick to pick up on trends which would catch the attention of their young audiences, the CFF-produced works covering a wide range of subjects including space travel and alien life, as seen here. Fergusson’s Supersonic Saucer (1956), the weakest of the three films handpicked for the collection, features Meba – a small creature from Venus who finds itself befriended by three schoolchildren when it’s inadvertently waylaid on Earth. During the course of its stay on our planet, Meba becomes involved in helping its new friends foil an attempted robbery at their school on the outskirts of London. Shand’s Kadoyng (1972), meanwhile, revolves around the story of the British village of Byway, which is under threat from a new motorway which is about to built through its centre. Only when a strange spaceship from the faraway planet of Stoikal crash lands nearby, and it’s alien owner uses some bizarre powers to help the Byway residents outwit the developers, does the village stand a chance of surviving this impending disaster. 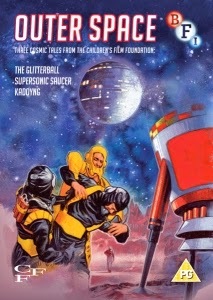 The Glitterball (1977), which was nominated for Best Film at the 1982 International Fantasy Film Awards, is probably the most sophisticated of the three, due to it being the most recent and by clearly having a bigger budget at its disposal. Cokeliss follows the exploits of a visiting alien, this time a silver ball, who must try to avoid with the help of a couple of kids, not only the air force but also a small time crook, after it finding itself stranded on Earth. Though the films may seem pedestrian in the light of today’s more sophisticated children’s entertainment, it is their air of naive charm and innocence which makes them appealing. Featuring an array of child stars and stalwarts from British television and film, they include Chitty Chitty Bang Bang’s (1968) Adrian Hall, To The Manor Born’s Gerald Sim and Ron Pember, who was never off television screens at the time. With storylines featuring everything from extraterrestrials with a penchant for petty theft, to abnormally large plants reminiscent of The Day of the Triffids (1981), these films were never short of imagination which verged on the sinister and chilling. Watched even now, it’s easy to see why they’re still considered classics of their kind. The BFI Sci-Fi: Days of Fear and Wonder season runs from October 2014-December 2015. More info found here.